reporters upon arrival in the capital of Tehran , as reported by the site thepeninsulaqatar.com , Sunday ( 29/9 ) .
" They gave it back as a special gift to the Iranian nation , " Rouhani said referring to artifacts from the 7th century BC , a silver vessel in the form of a winged Griffin . Griffin is a legendary creature with the body , tail , back and legs lion , and winged hawk -headed , as well as the eagle claw front legs . This artifact reportedly worth more than USD 11.5 billion . 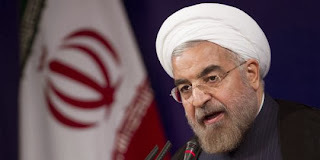 Rouhani exchanged views with U.S. officials about the return of the confiscated antiquities , known in art circles as a rhyton , to Iran on the sidelines of the UN General Assembly in New York City , USA . Having looted from a cave in Iran , the vessel was seized by U.S. customs officials in 2003 , when an art dealer trying to smuggle into the country . Head of Cultural Heritage, Tourism and Handicrafts Iran , Mohammad Ali Najafi , who also accompanies Rouhani to New York City , welcomed the news .
" We hope this will mark the return of artifacts of early return of other artifacts , " Najafi said , as quoted by IRNA news agency .